There's a new book "Blood, Tears & Glory" by James Bissland in which he states that the Civil War was the most important event in the United States since the Constitution. When the US Constitution was adopted, it did not resolve the issue of slavery. That would take the war between the states to achieve a political solution written with American's blood. In lives lost, the Civil War would the most costly of any other war fought. Six hundred and twenty thousand lives; 620,000 men and women gave their lives for what they believed. Up to the outbreak of the great war, most of Ohio tended to ignore the social conflict brewing. On occasion the differences between north and south would erupt, but for the most part, Ohio's citizens were busy growing into one of the most industrious states in the Union. In 1859, just a little over a year before actual fighting erupted, a man from northeastern Ohio called John Brown would provide the match that would ignite the country in conflict. Although he was born in Connecticut, his family moved to Hudson, Ohio in 1805 when John was just 5 years old. As John grew up in the small community, he developed from his father and others in the community, a deep hatred for slavery. 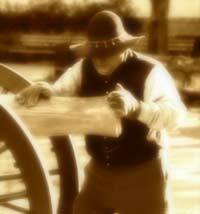 At 4:30 a.m. on Friday, April 12, 1861, cannon fire was heard over the harbor at Charleston, South Carolina. The cannon fire was aimed at Fort Sumter. While both sides exchanged fire, Fort Sumter fell quickly. In charge of the southern forces firing on the fort, was Roswell Ripley. Ripley was born in Worthington Ohio in 1823, graduated from West Point 20 years later, and like many of those who would later become generals during the Civil War, took part in the Mexican-American War. 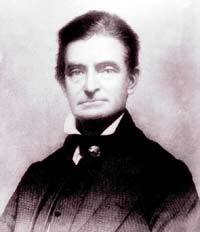 Ripley resigned his commission in 1853 while stationed in South Carolina. However, with South Carolina's secession, he joined the confederate army. With the surrender of Fort Sumter, the Charleston paper stated "The revolution of 1860 has been initiated." 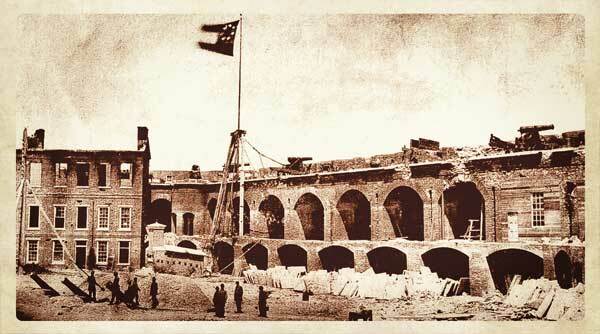 Above image was taken at Fort Sumter just days after the surrender of the fort to Confederate forces. The Confederate flag is show flying. The first shots of the Civil War took place here, on April 12, 1861, as Confederate batteries opened fire on the Union fort, bombarding it for 34 straight hours. On April 13, Union forces surrendered and evacuated the fort. Union forces made many attempts to retake the fort throughout the war, but only took possession on February 22, 1865, after Confederate forces had evacuated Charleston. One year later to the day of the firing on Fort Sumter a group of 19 Ohio soldiers and 2 civilians known collectively as Andrews Raiders headed south. When it was over, they would be responsible for one of the most daring raids in military history and would become the first recipients of the Medal of Honor. 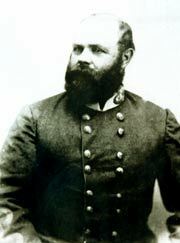 The group was led by civilian scout James Andrews (who was born in Weirton, West Virginia) who led the group into northern Georgia where they commandeered a Confederate train and drove it north towards Chattanooga doing as much damage as possible to vital railroad lines and cutting telegraph wires. At about 6 a.m. on April 12, 1862, Andrews raiders, dressed in appropriate civilian attire, boarded and captured the locomotive General as it was taking on fuel and water at the Big Shanty depot in Georgia. Just 18 miles from Chattanooga, the locomotive ran out of fuel and the raiders abandoned the train and scattered. Over the 2 weeks, all of the men were captured and some were executed as spies, while others made a daring escape and returned to the safety of Union lines. Jacob Wilson Parrott, born in Lancaster, Ohio joining the Army in 1861 as a private in Company K, 33rd Ohio Infantry. Having already seen combat, Parrott volunteered to take part in the raid. Parrott was one of the men later captured and it was because of the severe treatment he endured as a prisoner, that Secretary of War Edwin Stanton, awarded the Medals of Honor to him. After the war, Parrot returned to Ohio and became a cabinet maker. He died in Kenton, Ohio and is buried in Grove Cemetery. All of the men except for the 2 civilians (not eligible for the medal) were eventually awarded the Medals of Honor. Each militia unit could choose their own uniforms. Training usually meant learning how to accomplish parade maneuvers without bumping into one and other. All together, before the start of the war, Ohio had just over 1,000 militia members. In Ohio, word came quickly to most of the state over the new telegraph wires. On Saturday, newspapers such as the Ohio State Journal in Columbus ran headlines stating "THE WAR BEGUN!! The Rebels Fire the First Shot!" In Cleveland, the Cleveland Morning Leader read: "THE WAR HAS BEGUN!!! FORT SUMTER ATTACKED YESTERDAY MORNING!" Immediately after the news reached Ohio, citizens brought out flags, and bunting, everything that could be associated with patriotism was put on display. Anxious crowds gathered around the newspaper offices to hear the latest news read out loud. By Monday, Union fervor had only grown. In Cleveland the paper stated that "no man should be allowed to live in Ohio who is not for the Union first, last, and all the time." 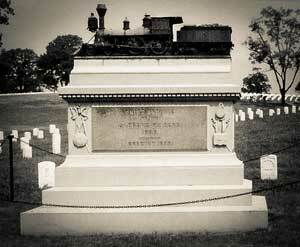 A number of generals had roots in Ohio including Ulysses S. Grant, William T. Sherman, and Philip H. Sheridan. The Fighting McCooks gained fame as the largest immediate family group ever to become officers in the U.S. Army. That spring in 1861, after the sound of the cannon firing on Fort Sumter and fell silent, men of all ages rushed to volunteer to fight the war. At the time, it was a common opinion that a show of force by the Union would force the Southern states to back down. The men traveling to Columbus were eager to be counted on to defend the nation and protect the Union. When Lincoln sent word throughout the country that there was a need for troops, Ohio's men answered. Lincoln's request for 13 regiments from Ohio. Ohio responded with enough men to make up 20 regiments. Thousands of men poured into Ohio so quickly that there weren't enough space to house, feed or provide uniforms for all of them. The Statehouse became a temporary campground as did Goodale Park. Every hotel, boarding house, public building, churches and even private homes helped house the men as they continued to arrive. It soon became a crises for the state to take care of everyone. Money was needed for food, weapons and uniforms. State agents were sent to neighboring states in order to acquire additional equipment and supplies. On April 19, Ohio's first regiment left Columbus for Washington D.C., just 7 days after those opening cannon signaled the beginning of the war that would last 4 bloody years. But the men arriving and departing from Columbus had no idea. They all believed it would be over in 3 months and that they would be back home in time for the fall harvest. After fighting for five days and nights with but two days rations before Vicksburg; after skirmishing, charging, deploying in line and again in mass, standing picket, supporting batteries, building breastworks for ourselves and charging as those of the enemy; in short after five days of the most laborious, hazardous and terrible hardship and privations, when we expected relief, we received order to get ready to march in an hour. Well, here we are eleven miles from the battlefield and in fact I feel relieved; I was almost tired of hearing the incessant roar of the hundreds of cannons and mortars, the rattling of musketry, which never ceased for a minute the five days and the former never stopped any for the last five days or nights. It seems like Sunday to us, to be without the continual whizzing of bullets and bursting of shells, but how long we may be permitted to enjoy this pleasant quietude, God only knows. Ohio had 2 Confederate Prisoner of War Camps. Today, all that remains of each camp are the cemeteries. Camp Chase located on the west side of Columbus started out as a training camp for new recruits when the war began. That lasted about 8 months. It was then converted to a prisoner of war camp operated by citizens of Columbus and the state. For a prisoner of war camp, things were pretty congenial at Camp Chase. Visitors could come and go at the camp and officers were free to stroll the streets of Columbus as they pleased as long as they were back at camp for evening roll call. Columbus's social societies brought food and clothing to the camp. Those were the early days. As the war began to drag on and casualties from the war mounted, conditions at the camp changed and it was decided to turn over the operations to the Federal government. Conditions in the camp changed quickly and became deplorable. Many men died in the camp because of those conditions which included poor food, poor medical facilities, and poor housing conditions. The other camp in Ohio was on Johnson's Island, which is not far from where Marblehead Lighthouse is located. This camp was designed and built to house prisoners from the outset. It's location was specifically selected because of its isolation and was used to house Confederate officers. How Much did that War Cost Ohio? By 1865, over 300,000 Ohioans had enlisted in the army. Among all the Union states, Ohio provided the third largest number of troops to the war, second to only New York and Pennsylvania. Whereas in other states, as the war dragged on, drafts were necessary to fill the quickly diminishing ranks, very few men were ever needed to be drafted from Ohio. The human cost of the war in Ohio would total more than 35,000 Ohio lives lost. One of every 10 Ohioans serving in the war, never returned home. Horrendous casualties would total in the hundreds of thousands. Once the war was over, and the fighting men started to return, many would never re-adjust to the mental toll of the war. For the most part, all the fighting during the war was mostly in other states, except for the summer of 1863. Ohio's population was just learning about Gettysburg and the surrender of Vicksburg. There was much to be encouraged about as the Civil War was entering its 2nd year. That was when the war came to Ohio. It was called Morgan's Raid, which included the Battle of Buffington Island as well as numerous other skirmishes throughout southern Ohio. A band of 2500 rebel cavalry went from town to town in southern Ohio, stealing and looting through the small towns.